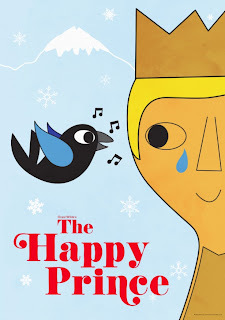 Donegal Gathering: RTE Junior presents the Happy Prince! RTE Junior presents the Happy Prince! RTE Junior radio presents a live broadcast and video cast of the Donegal adaptation of Oscar Wilde’s The Happy Prince with the Donegal Youth Orchestra & Youth Choir on Friday May 18th @ 2pm and you are invited you to listen in!!! Pack up the school bags or put on the kettle and enjoy a 45 minute magical radio treat! Ireland and particularly Donegal is known for its creativity. Oscar Wilde, who wrote the beautiful story ‘The Happy Prince’, is one of Ireland’s most famous writers. Donegal County Council Cultural Services Public Art Program decided that they wanted to write a new adaptation of this most special story but write it in a way that made best use of our creative strengths in Donegal, which include music, storytelling and performance. They worked from this existing text, and writer, actor, storyteller and musician Little John Nee and composer Vincent Kennedy were commissioned to write and perform an orchestral/narrated Donegal adaptation of Oscar Wilde's The Happy Prince. They also asked Donegal Youth Orchestra if they wrote something especially for them, would they be interested in performing it and they said yes. The world premiere was performed in Donegal in April but now, with the support of RTE Jnr you are invited to enjoy and experience this Donegal adaptation of 'The Happy Prince'. You can listen to RTÉjr Radio on your digital radio, online at www.rte.ie/digitalradio/rtejr, on Saorview and on the RTÉ Radio Player online, on iPad or on your mobile device. There is also an education pack that can be downloaded in Irish and English to enhance the experience for our younger 7-12 age group.